Praghree (Praghri/Pragri), a crunchy, layered puff stuffed with Khoya/mawa, is a seasonal delicacy, made only during Holi Festival ( Indian Festival of colours). Rarely will you find these crunchy, sticky delights during rest of the year. Very high in calories but an addictive sweet, Praghree have many fans; specially from Sindhi Community. 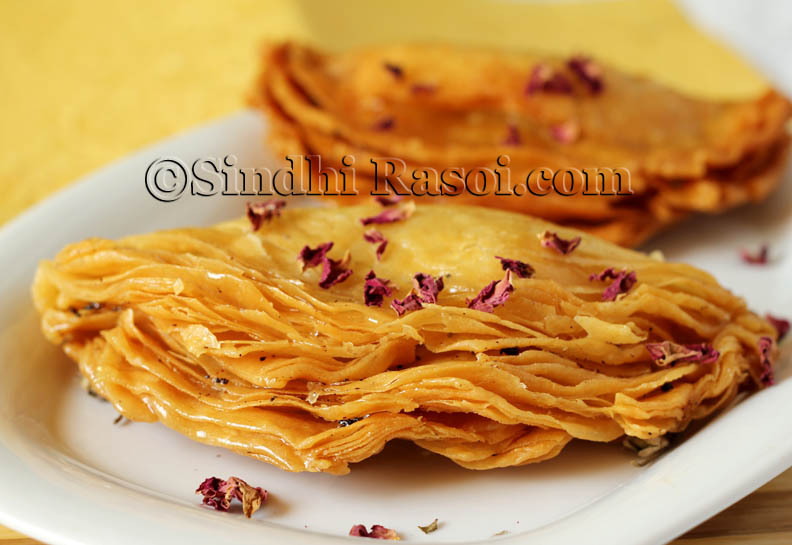 Almost every Sindhi sweet shop will stock this around Holi and generally there are two varieties of it. One is stuffed with Khoya and other with Chabu Halwo (cornflour pudding/Bombay Karachi halwa). This fascinating sweet could be made at home, but you need to have a heart to fry these in Dalda ghee (hydrogenated vegetable oil ) if you want the sweet to remain crunchy for long. As for me, I chickened out and fried it in sunflower oil. Well, there are many minute details that I need to share with you all, regarding this recipe, so stay focused here! Generally everyone around, buy Praghree from sweet shop, during the festive season. Seldom people make these at home.Hence not much of the reference was available online or in cookbooks. So let me first thank the people who helped me out to gather information and provide tips. I had the brief idea of making Praghree and the rough measurements of ingredients, thanks to Late ‘Baba’, an elderly person in my neighborhood. I have some of his recipes,on this blog of mine. So the base recipe is of ‘Baba’. But sadly he left us before I can get exact details of ‘folding’ and ‘rolling’ praghree, in traditional ways. After loads of research, I found that the texture and look of praghree resembles Spiral curry puffs , not exactly, but I think that the similar method of rolling might work. Before I could make up my mind to take a plunge, I came across the BLC’s ‘Flavors of Sind‘ book and I was happy to find a workable method of making Praghree. I went ahead with the method mentioned in the book and followed the recipe casually shared by Late ‘Baba’, and voila ! I got nice, crunchy, crisp golden Praghree. After all the efforts put in, I was happy to munch on a home made praghree, but then I realized that though it was crunchy and sweet, the sweetness lacked the depth of flavor. 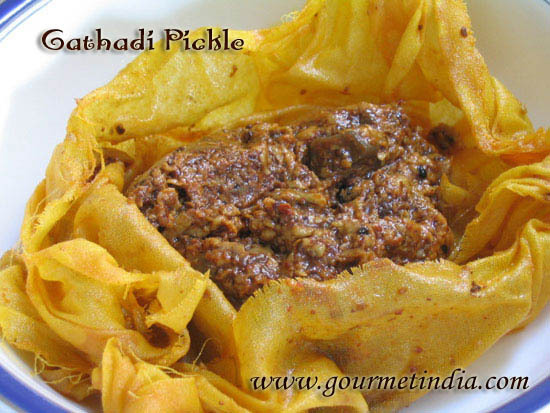 Also by next day, the leftover Praghree went soggy, unlike store brought ones, that stay crunchy even if stored for days. Also my friend Kurush Dalal helped me a lot in my ‘research’, while I was trying to understand the origin and basics of this recipe. Thanks to him, I now know that even Parsi and Bohri cuisine have a sweet delicacy named Mawa Nu Khaja, which is made in somewhat similar way. The Parsi version also makes use of clotted cream apart from mawa/khoya. The recipe have loads of scope for hits-and- miss. So in case, you try out this recipe, please let me know whether it worked for you or not. 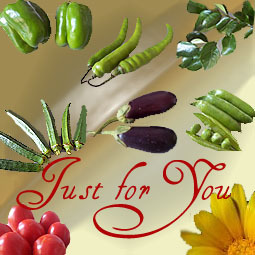 Your inputs will help me and other readers of this blog, to fine tune this recipe further. Also I used ‘unsweetened mawa’ instead of sweetened one and added few spoons of powdered sugar to it (not a good decision !). Please try to grab some sweetened mawa for better flavor. I generally do not use any kind of essence (except vanilla essence for the bakes) and artificial colours in my food. This too backfired, and excluding out rose essence made the syrup very bland. So please use Rose and/or Kewra essence in the syrup…just few drops ! In a pan, mix 1¼ cup sugar with 1 cup of water, add crushed cardamoms and soaked saffron (along with the water in which saffron was soaked) and boil the syrup for around 3-4 minutes, or till a thin syrup is made. Put off the flame and add 2-3 drops of rose essence.Mix and keep it covered with a lid. 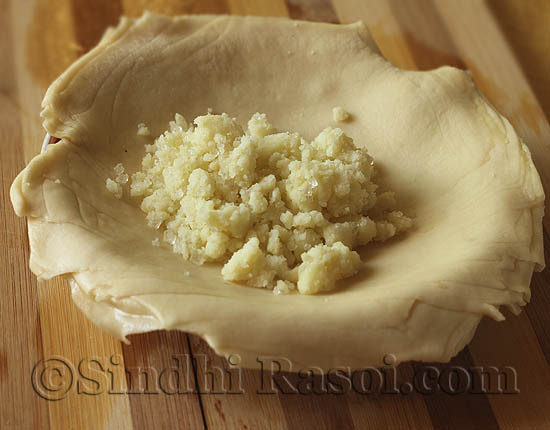 Mix the maida and Dalda/ghee and knead a stiff flour using some water. Let it rest for a while. The rested dough is now ready to roll. Divide the dough into 7 portions. Take one portion (let us call this portion as Portion A) out on the rolling board/clean surface and cover the rest of the dough so that it doesn't dry out! Now divide this Portion A, into 4 smaller portions, each being of the size smaller than a lemon/lime. 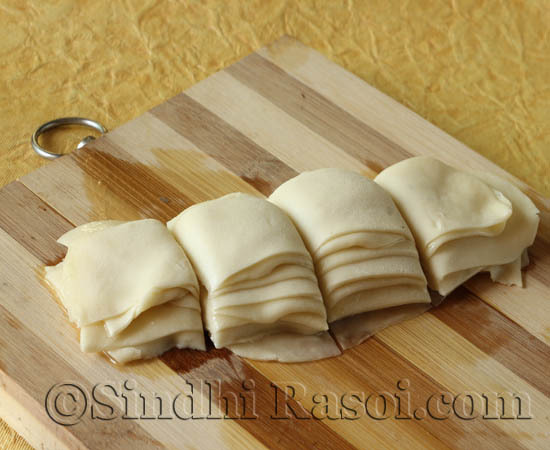 Roll these four individual portions into small chapati. Prepare an uncooked roux/paste of melted ghee and maida. Smear each small chapati with this paste (Approx. 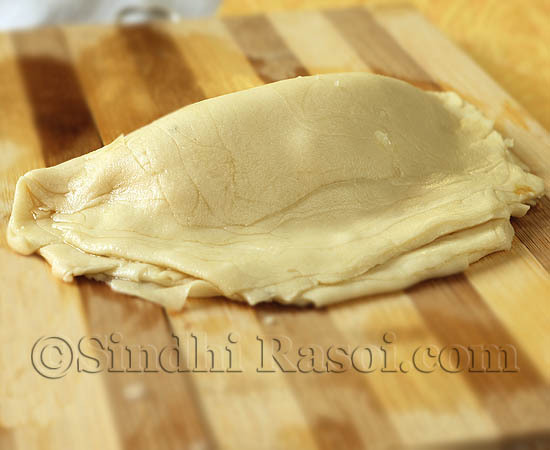 1-11/2 tsp for each chapati), by spreading the paste well. This roux or paste will work as binding agent between the layers. 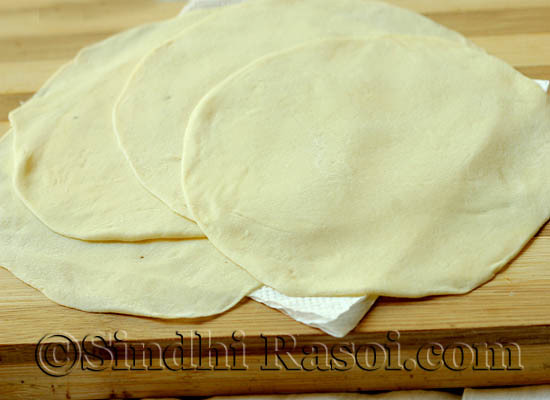 Now cut each chapati into 2 cm wide strips. Place the strips one on other . Repeat the same with rest of three chapatis and place all the strips on each other, to make a stack.Press this stack, gently! Here's how the tower of the strips look likes! 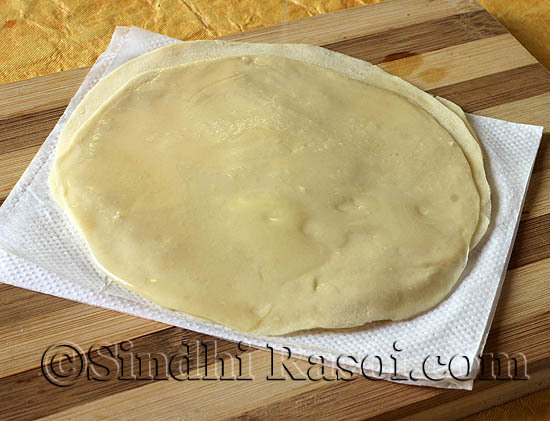 Sprinkle some dry flour on rolling board/ clean surface and roll the prepared stack into more or less circle shape. 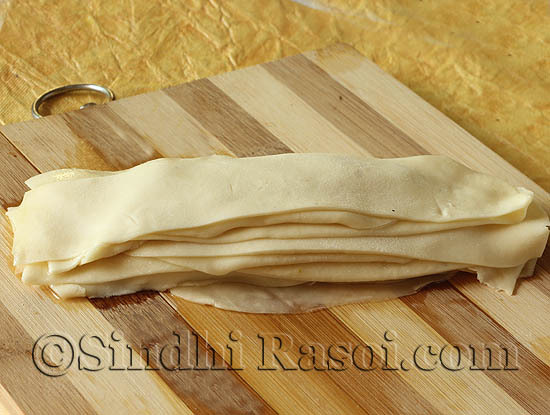 Place a heaped tsp (or a bit more) of sweetened mawa in the centre of the rolled chapati.Now dip your fingers in water and gently tap your fingers around the mawa (be careful as not to press the edges ). 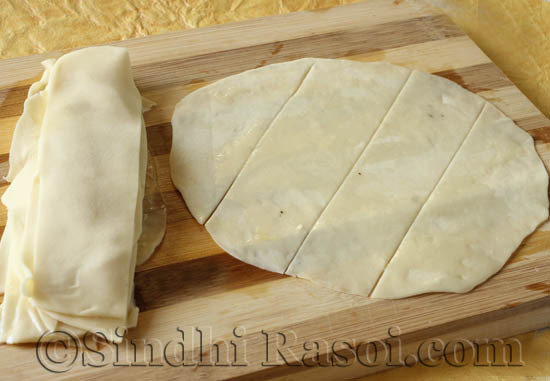 Gently fold over the rolled dough, to make a half circled, filled chapati (Like Gujiya). Press the dough around the mawa stuffing (and not around the edges of the half circle). This will be our first Pragri (puff). Keep all the puffs covered with a cloth to avoid formation of any crusts. Now heat dalda/oil/ or mixture of dalda and oil, in a frying pan. Deep fry each puff, one at a time, on the lowest flame, turning intermittently, very gently, till golden brown. Frying on higher flame will leave the puffs undercooked from inside. Drain on kitchen towel/ tissue paper and fry the rest of the puffs, one at a time! COOL THE PUFFS COMPLETELY ! 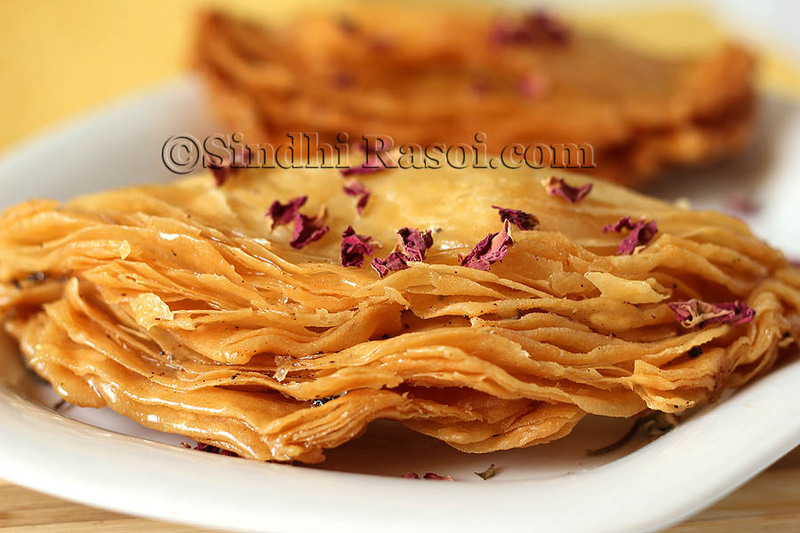 Place the syrup coated puff on a plate and garnish with petals/ varak/nuts. Cool and store in airtight containers.These stay good at room temperature for few days. 1) You can add chopped nuts or crushed dried fruits to the sweetened mawa. 2) You can stuff the puffs with Bombay karachi halwa (Place a piece of halwa in the centre of rolled chapati,instead of mawa. TIPS SHARED BY Mr. SURESH HINDUJA FOR CRUNCHY PRAGHREE ! 2) Using Dalda ghee to make roux (paste). 6) As soon as the syrup is ready, cover it with a lid to trap the aroma. I am sure that if anyone making the Praghree at home, will be able to make it better than mine, since now you all have the handy hints by Suresh. Thank you Suresh, for the kind help and handy tips ! Nice crunchy layered sweet puffs.. looks easy to make as well…should give it a try some time. Thanks for detailed steps. 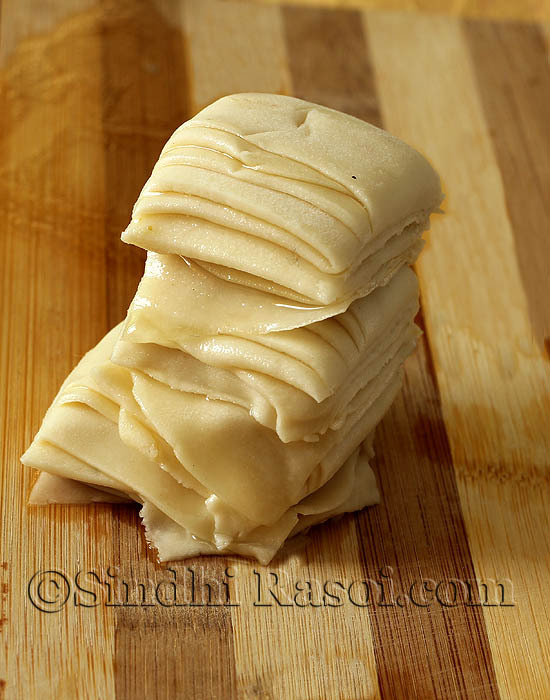 I had seen this sweet at a Sindhi sweet shop, did’nt know the name. Very well illustrated. It looks so tempting. I tried it with minor changes. It came out very good. Thanks for posting it. Thanks a lot for sharing the recipe, every step is explained so well that one just cannot go wrong. I tried it for this holi and it turned out amazing. Fantastic recipe and explanation of the process. Reminds me of the middle eastern baklava? Delicious, I made the same without mawa filling for Diwali. They came out crunchy and delicious! 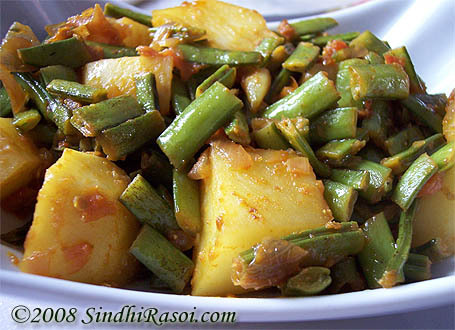 Dear Alakaji Thank you very much for this wonderful recipe. I appriciate your research hard work that give us original recipe.Your step by step photoes are also good .You are a good teacher.You made our task so simple. seems nice to looknad easy to make. i will definitely try it at home. Alka, I will try this out when I am back in India as I cannot get all the ingredients here.. Can’t wait to try them out !